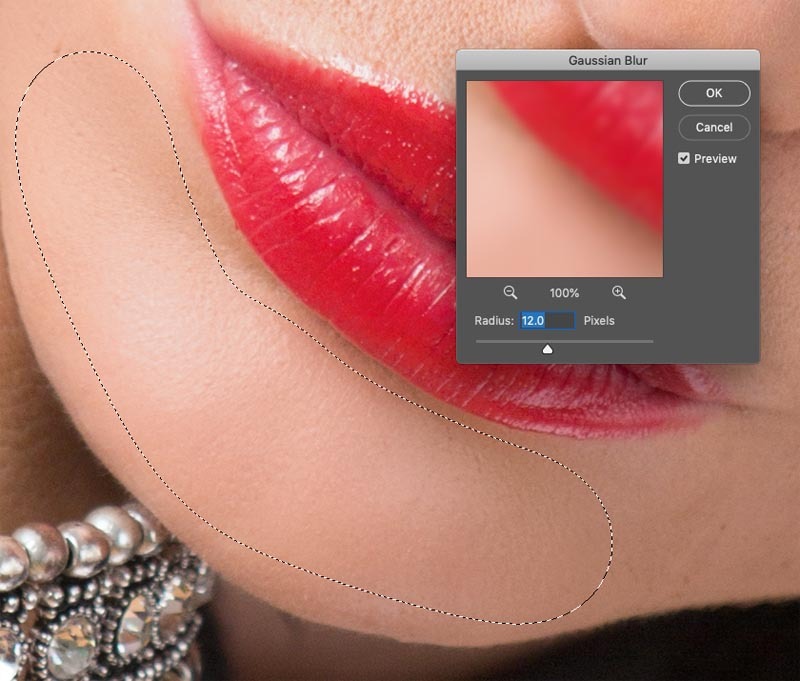 How to use Frequency Separation in Photoshop for smooth silky skin without losing the pores. 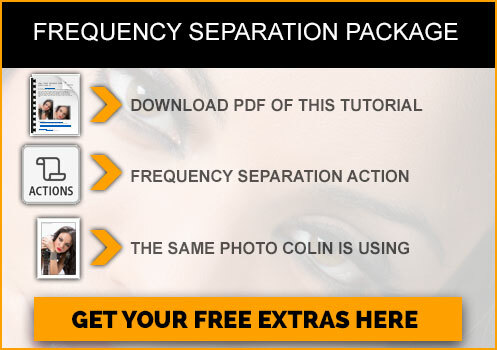 You may have heard the term Frequency Separation and wondered what it is. 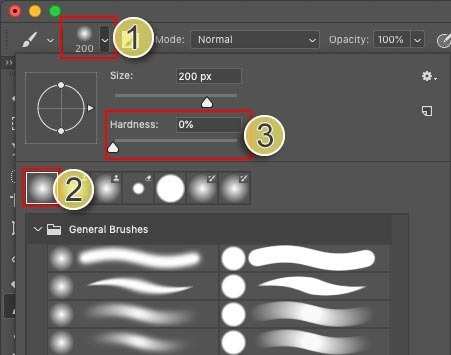 Or you have heard that all the high end retouchers are using this technique. Or, you may wonder how to smoothen out skin and remove blemishes and uneven coloring. 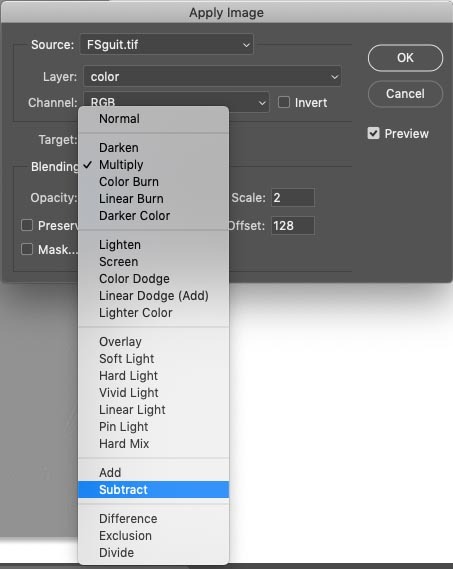 In this Photoshop tutorial, Colin Smith explains what frequency separations is and how to use it without all the jargon. We pull back the veil and the mystery and lay it out in easy to follow steps. © Colin Smith | Thanks to Lina for modeling for me in the photograph. Retouching, often misnamed as “airbrushing” is the technique of smoothing out the skin in a way that is more of an aesthetic than reality. The frequency separation technique I’m showing here is a requested style often used in Glamour and Fashion photography. It’s used in so-called “high end retouching” and not the kind of technique you would normally use on family portraits and corporate headshots. It’s a way to transform skin into a particular look that is sometimes required in retouching. Some people absolutely love this look and others dislike it. As a rule of thumb, a good retouch is something that doesn’t look retouched. In certain situations, this isn’t true, some styles require it to look retouched and “too” perfect is what’s required. Its a great way to smoothen out skin and you can choose to use it as heavily or lightly as you wish. In this case we are going to a style that you might find on the cover of a fashion magazine. There is a lot of argument around “airbrushing” and ethics. My goal here is not to get into all of that, but rather, just present a tutorial on a technique that viewers have requested to learn here at PhotoshopCAFE. Frequency Separation is a bit of a mystery to those who haven’t used it and it may seem out of reach. My goal is to present it here in a way that anyone can start using and understanding the technique. I’m going to avoid jargon and make it as simple as I possibly can. I hope you enjoy this tutorial. Frequency: High Frequency is the detail (think treble). Low frequency is the underlying color and form (think Bass). Separation: Spilting, dividing etc. In this case splitting into 2 parts. Ok, definition is over, time to do it! There are 3 steps. 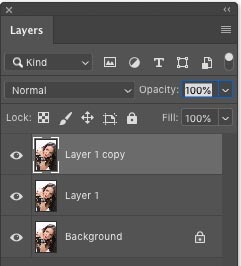 Duplicate the layer 2x, so that there are 3 layers. Press Cmd/Ctrl+J twice. 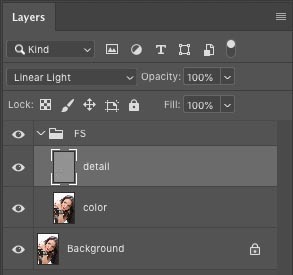 Click, hold Shift and click on the next layer to select the 2 top layers. Name the 2nd layer Color (LowFrequency. I won’t use the term frequency again in this tutorial except for the name, because its just jargon). 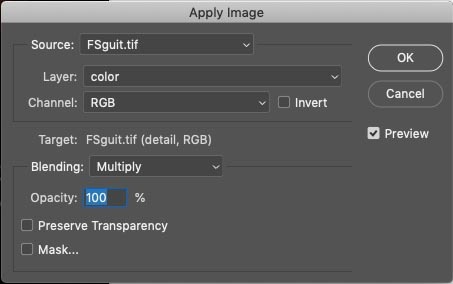 Turn off visibility on the detail layer and choose the color layer. Move the amount just enough that the detail of the pores disappears. 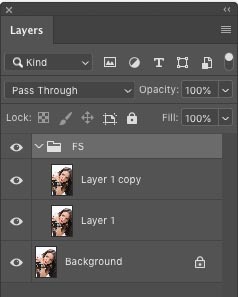 (4.2 here – choose a higher number if needed) Click ok, this layer is ready. 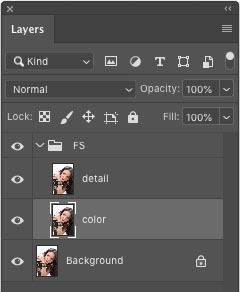 In the dialog box, choose the color layer from the layer drop down. (we named it color in step 1).  You will still see the gray image. Change the blending mode to linear Light and it should now look exactly like the original image. The Frequency Separation layers are all set and ready for use. 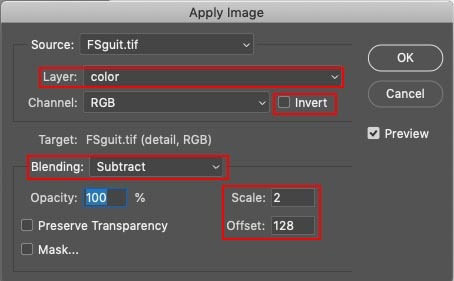 Note about 16 bit vs 8 bit (not a tutorial step): I like to suggest that these settings I present work on both 8-bit and 16-bit images. I have seen different settings floating around for 8-bit vs 16-bit images. I have tried both sets of settings on both 8-bit and 16-bit images and I can’t see the difference. I’m open to being corrected, but please start with a 16-bit version of the image and apply both sets of settings. Then make an 8-bit version and apply both sets of settings. There may be a difference between 8-bit and 16-bit images, but do the settings actually look any different? 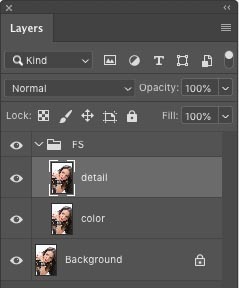 Now it’s time to do the retouching using the layers we have prepared. Starting with the detail layer selected. Choose the healing brush (Or spot healing or clone stamp, whatever you prefer). 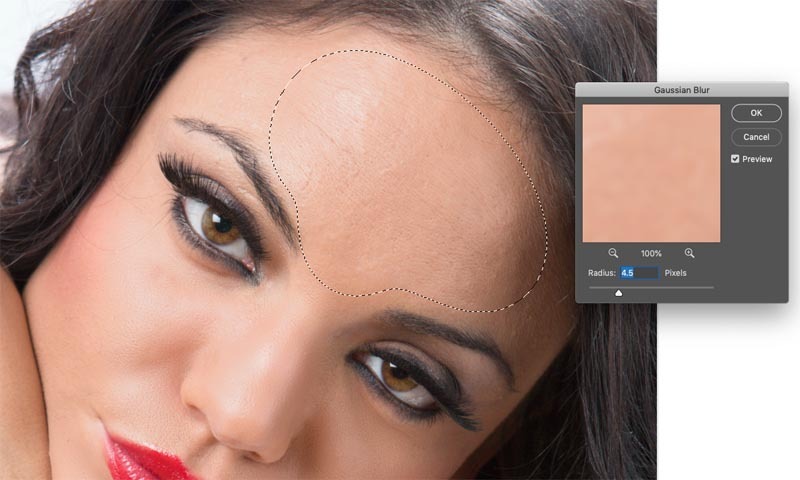 To use the Haeling brush, hold down Alt/Option and click on a good area near the blemish to sample it. Click with the healing bush on the area that you want to cover up. On the detail layer, do your removal of things like acne, blackheads etc, In this case, I didn’t need to do much because Lina has great skin naturally. This step is where the frequency Separation really kicks in. Double click the quick mask to set it up. Everyone I have seen do FS, uses the lasso tool, makes a selection and then feathers it. 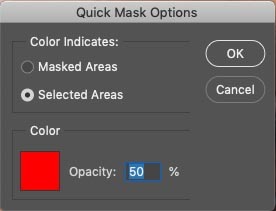 (So feel free to do that if you like) I prefer to use Quickmask, because I can paint on my selection and it already has a soft edge. Let’s start with the chin. Adjust your brush size [ or ] keys. Paint on the chin, you should see a reddish color as shown. If not, press undo and go back over all the parts of step 4 to see what step you may have missed. (Also watch my video at the top of the tutorial page, which you should have done anyway 😉 ). Press Q to toggle to a selection. (Q toggles between quick mask and a selection). See the before and after? This is the major part of Frequency separation. 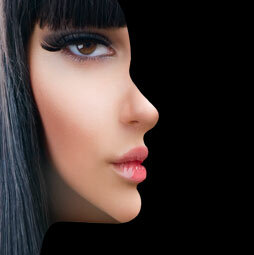 We are able to smoothen out the color and tones without losing the detail such as pores. You can use quick select to choose multiple areas as shown. I always do the face and forehead separately though, because they have a different grain structure and will require different amounts of blur. 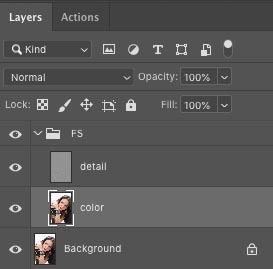 (Please note, if you have more time, you can get an even better result by using the healing brush/clone stamp tool here instead of blur, but it does take more time and work). Also here is a before and after version with a more subtle blur of 5 applied to the entire face (on the color layer). Choose if you want to go heavy or more subtle. Notice we can smoothen out the skin without losing the skin texture such as pores. 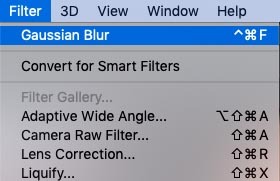 You never want to blur the skin without using frequency separation, or it will look like a plastic mannequin. So, there’s Frequency Separation for you in a nutshell. Not so hard after all huh? Colin, good stuff, thanks. I do commercial portraits, business people, doctors, bankers, etc for web sites, brochures, or sometimes wall portraits in offices. There are many technique to smooth the silky skin. But, It’s the easy way to do this work. Thanks, dear for sahring your creativity.